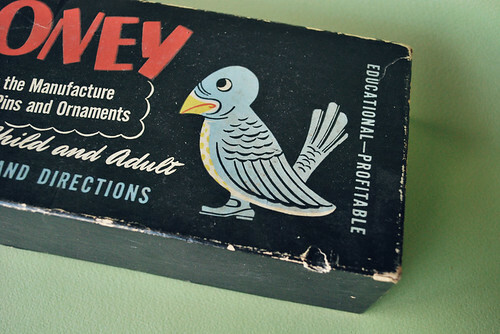 Vintage supplies and hand craft of all kinds make me happy. But the thing that I love most of all? 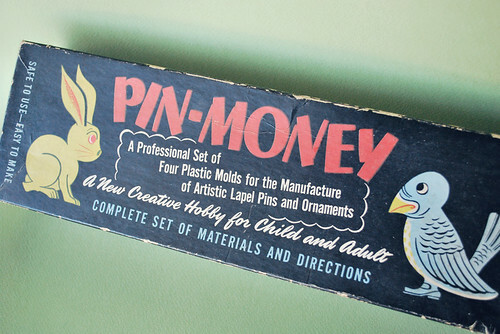 Old craft kits for kids. They are my weakness. I love the packaging, I love the lack of safety, I love the cuteness. Seriously. And I love that today I can show you something that is not so easy to find. 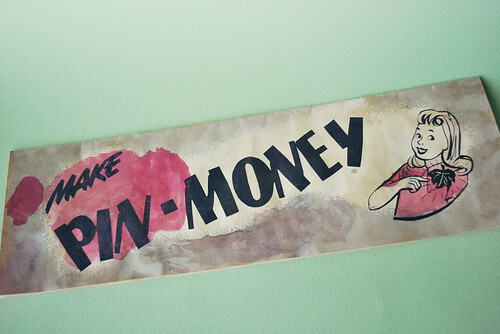 Pin-Money. 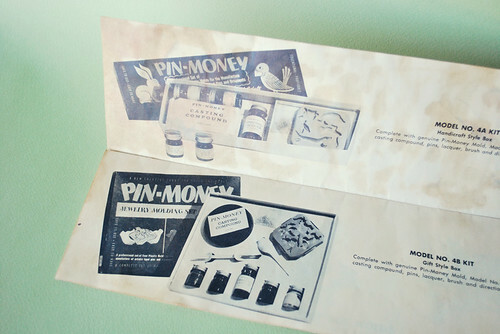 This was my mom's kit and she tells me that she LOVED it. And now it's mine! The kit came from Longwood Products Company in Chicago, but I've not been able to find other information about them. Take a look at this box and how they describe the kit. It's as if you could buy this and go into business! I especially love the "educational and profitable" part. Oh yeah, and that sweet bird! But what exactly does this kit have inside? Not much now. 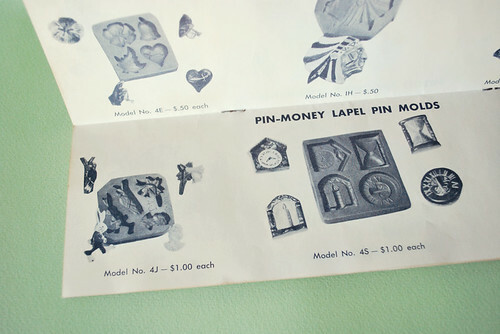 This was a set that was well used, and most likely the other molds were ruined or just lost. But I'll tell you about them. The molds are soft plastic, almost like rubber. They are for molding plaster! 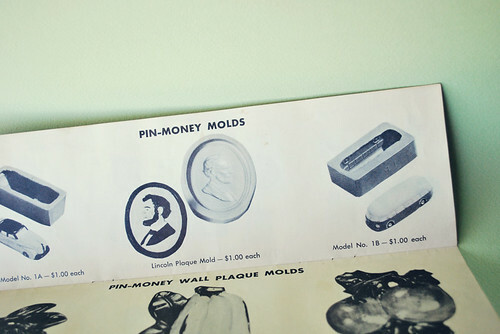 Originally, the kit included four molds, and all of the supplies you need. My mom thinks that I could safely use the one mold that is left...although, I'm a little nervous about wrecking it. how awesome! 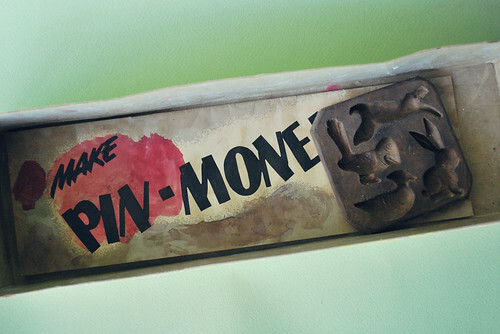 i can see being nervous to ruin this...maybe you can use it the once to make another mold of the mold? 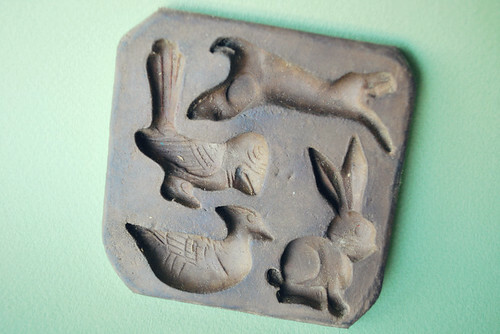 i totally want some vintage bird molds now! You may be able to create a duplicate mold off of the original so that you don't have to use it too much. I couldn't tell you how, I'm afraid, but it was the first thing that came to mind.